Crystal Reports is a dynamic reporting tool. It is a business intelligence reporting tools that used to design and generate reports from a range of data sources like oracle and MySQL. Crystal Reports establish a connection with Java and j2ee framework to display variety of report. Crystal Reports can works with .Net framework. Crystal Reports for Visual Studio .NET is one of the standard reporting tool for Visual Studio .NET; the main facility of it the light weight. It can produce interactive and dynamic report, deplorable presentation quality content that has been the strength and powerful mechanism of Crystal Reports for years to the .NET platform. So, if we think dynamically, Crystal Reports can works with Java and .Net framework. Now, in these articles we will show how to generate a crystal report. We need to install the Crystal Report software to our machine to use the reporting tool. At first, we need to make a connection with the database server. We open a report design file and establish a connection with the required database. After establish the connection, we need to write down the SQL query, depending on our requirement. We can able to pass any parameter, if we need to preview data upon any condition. Crystal Reports has Database Expert. 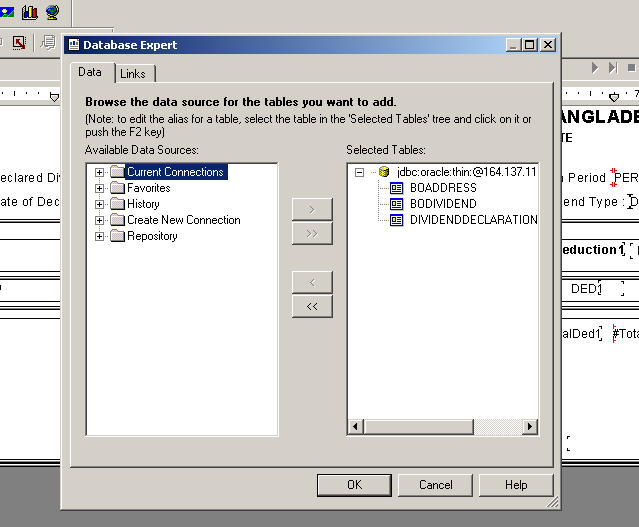 By using the Database Expert, anyone can select and link variety of tables from the data sources, including Microsoft PowerPoint and Microsoft Excel spreadsheets, Oracle databases, Business Objects Enterprise business views, and local file system information. 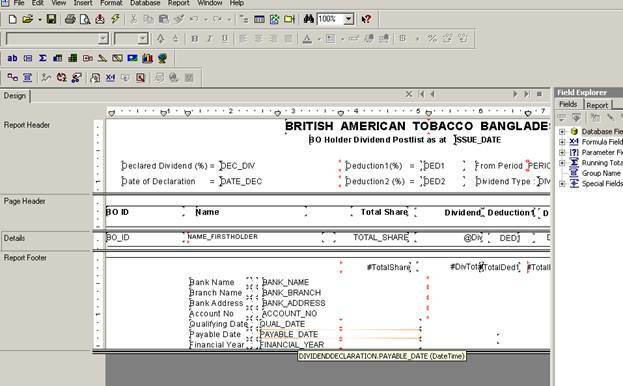 The Database Expert helps you to add any parameters and filters within the report. . At first need to make a data source. Depending on our requirement, we will develop a SQL query. Here we will provide the screen short of it. As per your requirement, you generate the data source. Most of the time, ‘Jsp’ pages use pass any parameter. You can add any filter as per your requirement; this helps you to retrieve some data which want to show. Parameters and filters are important to design a report. With the preview of SQL, we find two parameters named ‘bo_folio’ and ‘mdate’. We will show the process how to send the parameter’s value and make interconnection with jsp and Crystal Report. We can able to drag and drop facilities in this reporting section. Crystal Reports provide the facilities of graphically design data connection(s) and design report layout. Crystal Reports provides the facilities to generate chart report like pie chart, bar chat, line chart etc. In the Crystal Reports design pattern we can add labels, grid, table and chart by drag and drop process. So, we just need to follow how to add the fields in the design layout. Fields from these tables can be placed on the report design surface, and can also be used in custom formulas, using either BASIC or Crystal's own syntax, that is then placed on the design surface. Formulas can be evaluated at several phases during report generation as specified by the developer. This jsp page is used to call the ‘Omnibus.jsp’ page. When we call the jsp page we will send two parameters that must for building the report. In the next jsp page there is show down two fields that’s inter connect with Crystal Report. Edit Data Set displays the columns you specified in the query, and provides options for editing the data set. Then, choose Preview Results to make sure the query is valid and that it returns the correct data. If you typed the SELECT statement correctly, you should see the results that are shown in the preview. This helps you to design the Crystal Report. It is very east to add any line and label in the report. This helps the designer lots to develop Crystal Report easily. Both fields and formulas have a wide array of formatting options available that can be applied absolutely or conditionally. The data can be grouped into bands, each of that can be split further and conditionally suppressed as needed. Crystal Reports also supports sub reports, graphing, and a limited amount of GIS functionality. In this section we pass two parameters. This file name is OmnibusReport.jsp. at a time, but its true power is working with multiple CrystalReports at the same time. By using this two jsp pages we can send the parameters and execute the Crystal report. 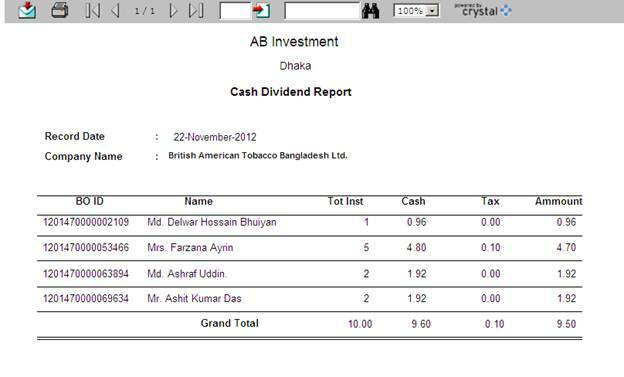 Crystal report is very user friendly and light weight, so we can use it by installing in our local machine. To get the facilities of this report we need to add some jar files to the projects. This is the total preview how we able to run a crystal report in j2ee server. This is all for this article. Hope you liked, see you next time.